Learners at Karaka school will be empowered with the mindset, competencies, tools and resilience required to become enthusiastic self managing learners who are able to confidently and creatively contribute to local and global communities. Learners will be nurtured, inspired and challenged through high expectations and the provision of progressive learning pathways and effective feedback within supportive learning environments. 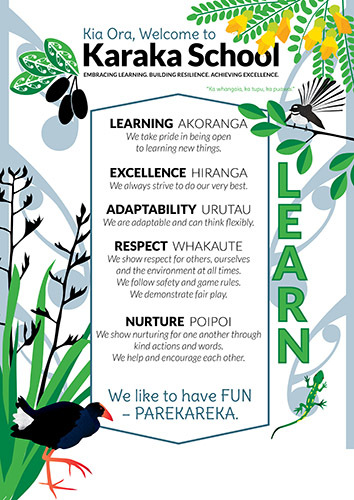 At Karaka School, excellence will be pursued and inquiry embraced. Our curriculum reflects the vision, values, strategic direction and goals of Karaka School and the New Zealand Currciulum. Click here to view an overview of the Karaka Curriculum.